Reports and commentary on the news, science, and creative ends of the media by John Farrell. The problem with relying solely on philosophy when it comes to discussing the 'big picture' about God and his role in the evolution of life, is that it too often gives cover to scientific stupidity. I would much rather say ignorance instead of stupidity, believe me. But ignorance is a condition that can be remedied, assuming the ignorant party is interested in learning the truth. That is not the case with many conservatives and the journalists who pander to them. In terms of science reporting and opinion, Tom Bethell is one example of an obdurately stupid journalist. As is Pat Buchanan. As is Ann Coulter. Note the journals they write for--they are magazines I used to find stimulating in college and afterwards. National Review, the American Spectator, for example. Now, I could pick on any one of these aging heavyweights, but for purposes of economy--and because he so regularly supplies ample ammunition, I'll confine myself to Tom Bethell as an example of what I mean. I'm not blaming the Cardinal, except to the extent that I think leaders of the Church are too careful sometimes, too cautious, in their weighing of urgent questions. Pope Benedict's recent assertion that the whole creationism v. evolution debate is "absurd" would have been more welcome, say, two years ago when Cardinal Schönborn signed his name to an ill-conceived attack on Darwin in the New York Times. Instead, the pope was content to wait until after the cautious, quiet seminars he felt he had to sit through before making up his mind. But at least he invited scientists to make their case--which is more than our mainstream conservative magazines do. A friend of mine, who is also a longtime reader of National Review and the other conservative opinion journals, had some interesting comments about this a while back in an email, and I think he's right on the money: "The problem with NRO is that it's intellectually incurious. It's gotten to be dull and airless because it's not really interested in exploring new ideas and rethinking old ones in light of experience, but instead serving as a political rallying point. There is so much more to conservatism -- or to be more precise, what interests, or should interest, conservatives -- than what happens in Washington, but that's all they seem to care about." Thus when Tom Bethell repeats his inaccurate cliches about Darwin's Theory (survival of the fittest is a tautology, dontcha know), he relies on Michael Behe and William Dembski to 'make his case'. Well, that's fine. What he does not do, however, is bother to look up any other working biologists or mathematicians who might broaden and challenge his sense of exactly what is going on (or more accurately--what is not going on) with ID. But talking to anyone who might politely disprove the point is just not part of what Bethell, Gilder, Buchanan, Coulter & Co. are up to. Which is the main reason why conservative journalists have ZERO credibility with a wider educated readership when it comes to science. If he took the time to interview, for example, this man, he would learn a few recent facts that the study of Darwin's theory has inspired. Steve Matheson, by the way, is precisely the sort of young Christian that Bethell loves to tout as the future student who will supposedly dispense with Darwin's theory. Far from dispensing with Darwin, lots of scientists like Matheson are running with him, and building even more impressive evidence for his theory. Common ancestry in plants, for example. And speaking of peppered moths, I wonder if the science journalism A-Team is even aware of this? Unlikely. What I would like Bethell, Buchanan, Gilder, and the other blow-hards of what passes for conservative 'science journalism' to explain, as carefully as they can, is how any sense can be made of modern biology apart from Darwin's theory? Even Michael Behe might admit that would be a tall order. But Bethell has shown that he is uninterested in speaking with anyone working in the discipline today. Why should he? It's far easier to quote-mine--out of context--long dead or retired scientists who don't even work in the field. Speaking of Behe, when asked to explain once what he meant by the 'designer' and how "irreducibly complex" elements actually got inserted into bacterial systems wholesale, he famously told Larry Arnhart it was 'a puff of smoke'. But as far as the current generation of gadflies posting 'science' articles to National Review and the American Spectator are concerned, if the philosophy suggested by science is intimidating or disturbing...well--by all means then, out with the baby along with the bathwater. Let's raise a generation of scientific illiterates so that they will have even fewer options to prosper in the challenging world of the future. There's a deeper issue here, of course. It's the problem that many conservatives have with the very methodological basis of science--methodological naturalism. They enjoy blaming this on Darwin as well. But it is not at all established that the old bugbear naturalism, the exclusion of supernatural explanations from scientific reasoning, is the product of Darwin and Huxley that so many conservative writers suggest. Upon closer examination, it actually goes back (at the very least) to the medieval universities--when the whole show was run by priests. In those days, atheists weren't even allowed to proclaim their skepticism, let alone teach. That sure sounds like methodological naturalism to me. It's also common sense. (Do you suppose when Pat Buchanan goes out to his car in the morning and finds one of the tires has gone flat he starts looking around for little gremlins?) I should add to this Aquinas' position that it is precisely a solid, stubborn, Aristotelian adherence to empirical facts about the natural order that can point beyond the natural--and not the other way around. Okay--but isn't this all just a tempest in a teapot? Why all the bother? Why get upset because mainstream conservative magazines are so out-of-touch with science? Who cares? The failure of purely physical theories to describe or explain information reflects Shannon's concept of entropy and his measure of "news." Information is defined by its independence from physical determination: If it is determined, it is predictable and thus by definition not information. Yet Darwinian science seemed to be reducing all nature to material causes. --and National Review's editor Rich Lowry apparently can't sit up in his office and say, "What the f%#$?" and get out his red pen, or ship it back with 'rejected', or at least send it to an expert for some comments...well, I think they're in trouble. What a small but growing number of conservatives are concerned about, is the wholesale linking of conservatism with bogus science, whether it goes by the name of "Intelligent Design" or "Young Earth Creationism" or "Alternative Electrodynamics" or astrology for that matter (which by the way Behe also thinks passes muster as science) --and the growing discredit that this brings upon conservatism as a whole. Such a state virtually guarantees that the only new blood the movement can count on gaining in the future, is precisely derived from the credulous and the ignorant, most aptly personified by the frightened ferrets now beating the drums for the firing of this man. Now, in fairness to National Review, perhaps the percentage of readers who are scared of Darwin is so large, the editors feel they just can't afford to educate alienate them and thus lose their subscription base and financial backing. Instead, they let John Derbyshire take the heat for being the lone voice of sanity on science. I don't know, as I don't work there. On the other hand, I don't recall whether Bill Buckley ever fretted over lost subscriptions when he decided to unload both barrels on the John Birch Society back in the early days of NR's glory. It had to be done to maintain the magazine's credibility. Well, it's high time for another maintenance job. Time to take an editorial stance against bogus science, no matter how much the think tanks complain. The luck of our soldiers, God bless 'em. 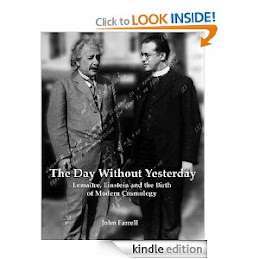 I'm a producer and author with special interest in the history of science and philosophy.